Rent Pioneer's newest Serato DJ battle-style 2 channel mixer at Soundhouse NYC. The Pioneer DJM-S9 is a high-end two channel club mixer built in the spirit of the legendary DJM-909. This is the first Serato DJ mixer to have performance pads and switchable FX banks. 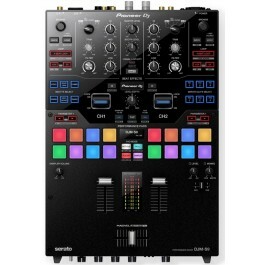 Complete with 2 USB ports for easy changeovers, Pioneer DJ beat FX and post fader Serato DJ FX. The DJM-S9 is a Serato DJ & DVS Enabled device and supports the use of Serato NoiseMap Control Vinyl or CD's with no additional license purchase.